Hi there! Had a little discussion about it on discourd and could not get it to work. Since it gets pushed away on discord, I thought I give the forum a try. Here`s where I run into trouble: If i press "5" it will only do it on my master. (infact it will send 2 to my master and nothing to my slaves) No matter if my cursor is in the master or in a VFX window, it will alsways end up on my master. Why do I need all of that? Well I want to have a fishing setup that I can toggle on and off (working) and use one of my combat keys that gets remapped and does a InteractwithMouseover on press and a /cast fishing on release. (I could also drag the fishing spell somewhere in an empty actionbar and bind a key to it, if macros won`t work. mRpIBB wrote: So any ideas? Not without taking a look at your profile. I have some ideas, which is probably that the Target is set to be Window Current, and you are expecting because you have passthrough on the viewer, that the keystroke will be passed through and the ISBoxer on the source end of that viewer will execute the mapped key. Doesn't work like that. The mapped key will execute on the actual window, regardless of the vfx viewer passthrough. VFX passthrough will pass through any keystroke which is NOT an ISBoxer hotkey. Hotkeys will execute on the current active window and then do what they are told, which might be to execute another mapped key on another slot, or do a keystroke action to a specific slot, BUT, using window:current as a target is going to execute on the current active window that is hosting the vfx viewer. Thats correct. It is set to window:current. So is there a way to make it work? Or at least parts of it? A double function that works on press and release for iwm and executing a macro or just a hotbar bound key would make fishing so much nicer. Sure, you can make it work. The easiest way will be to have a key map per slot, which target the correct slots, and also are loaded/unloaded on mouseover of the appropriate viewer. That sounds great! Could you please tell me how I can load up a keymap on mouseover? I cannot imagine any way to do something like that. Thanks for your help! So you create a mapped key with 2 steps. Step 1, load you Key Map for activation for this viewer (load it to Window:Current). Unload any other Key Maps you don't want active (again, Window:Current will be sufficient). Step 2, reverse the above, and unload the Key Map you want to deactivate, and Load up the Key Maps you need to re-activate. 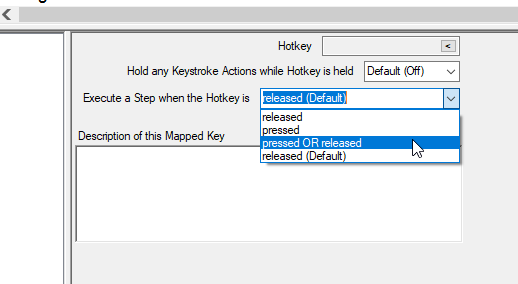 Now, in the Mapped Key options, for the drop down of Execute a Step when the Hotkey is "pressed OR released". And, set the videofx viewer to run this mapped key. I could not get it to work yet. Just when I thought I had everything right, it crashed my wow windows everytime I tried casting something via VFX. I will start over, use an empty config, just set the absolute basics up, try it and post my config here. This will take some time, but I will get it done in the next few days.